Over the last year I've noticed that I always choose my ankle boots over my tall boots. I love my tall boots, but for some reason never reach for them. This gives me all kinds of closet guilt because I just know my expensive boots are sitting in there feeling neglected. So this week I deliberately tried to style them and I think I found my solution! I love wearing them with my ripped denim! When I style ankle boots I love cuffing my jeans or wearing cropped denim- it breaks up the outfit and shows some skin (albeit ankle). Tall boots have just felt too buttoned up and stuffy. But styling them with ripped jeans add the edge back in. They suddenly feel less covered up, more fun, and just plain refreshed! All of my destroyed denim is DIY or at least enhanced by me. I did a tutorial about it here and it's pretty simple to rip out the knees. I just ripped the knees out on this pair and I'm already loving them even more. Just a couple of other things- 6pm is having a huge sale on their Frye boots right now. The pair I have on today is 50% off (what?!?) and they have a ton of other styles. I love these and these too! Also Maskcara- one of the best beauty bloggers out there- is finally opening up her store again today! She has been working on the most amazing contouring makeup out there and it goes live for sale again tonight at 6pm PST. I'll be snagging some for SURE. I think that is it- have a great Monday! I love those boots so much and wonder if my husband might get them for me for my birthday next month:) You always look so pretty! P.S. Would you say these boots are comfortable and easy to get on and off? I read some reviews that mentioned that. 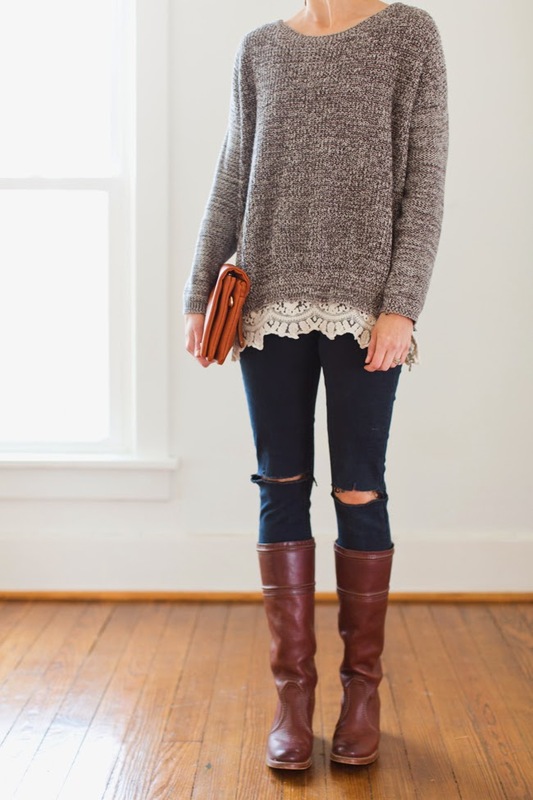 Love the idea of the distressed denim with high boots! Especially denim with rips in the knees! 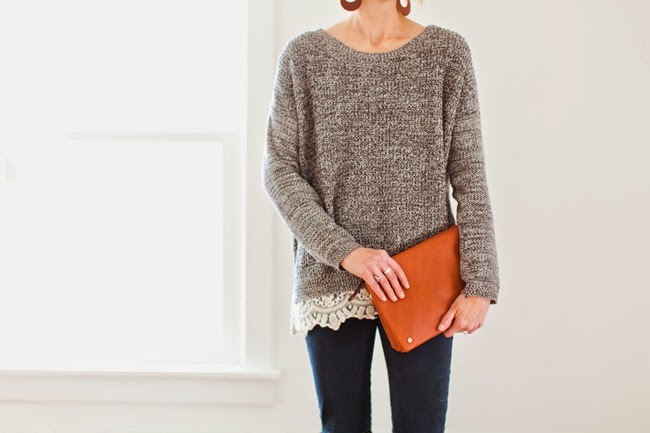 That sweater is beautiful!